Play Slots online and Spin the wheel of fortune and see what fruit it throws up. This one features all your traditional fruit machine culprits including juicy cherries and watermelons. This 5 reel has over 243 ways to win meaning there are endless possibilities for you to come away from this online slot with huge rewards. 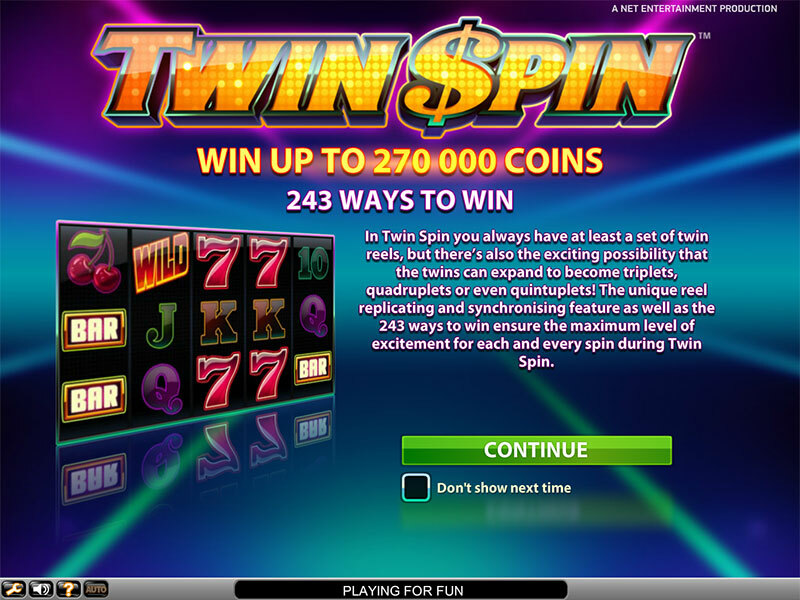 Twin Spin is a 243 pay line online slot game powered by NetEnt. From as little as £0.01 per spin to a maximum of £0.50, we can engage with one of the most vibrant and visually satisfying online slot games around. 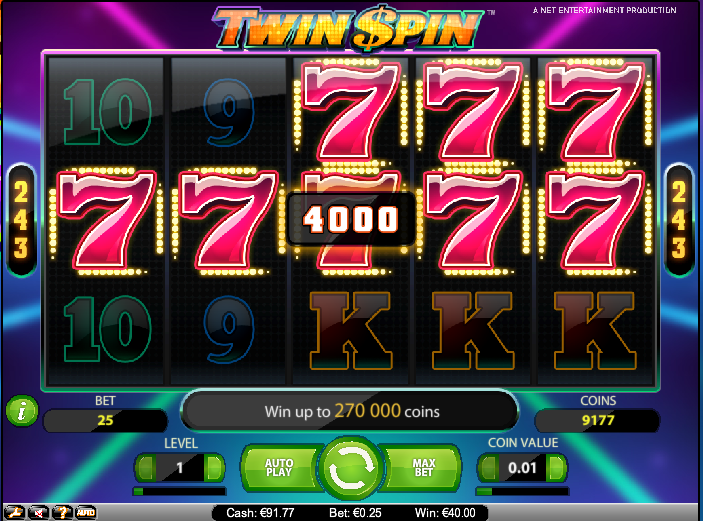 Twin Spin has all the feel of a classic, traditional slot title, but all the innovation of a modern digital casino solution. The game’s most innovative feature is that during every single spin, there are always two identical, adjacent twin reels spinning together. These twin reels can also expand to become triple, quadruple, or even quintuplet reels – considerably increasing the chance of winning, and winning big! The symbols we have to play with are 9 through Ace card symbols, each one created in the cool, near-neon theme that creates the cool, casino feel of the game. Alongside these lower value symbols, there are the old favourites of Cherries, Golden Bell, Bar, Lucky 7, Diamond, and the Twin Spin Wild – which substitutes for all other symbols in the game. The audio of the game, when combined with the subtle, but tangible sound effects, make the spins feel cool, real and constantly engaging. Little visual details, when the wins are piling up and the reels are alight, make each spin full of excitement. 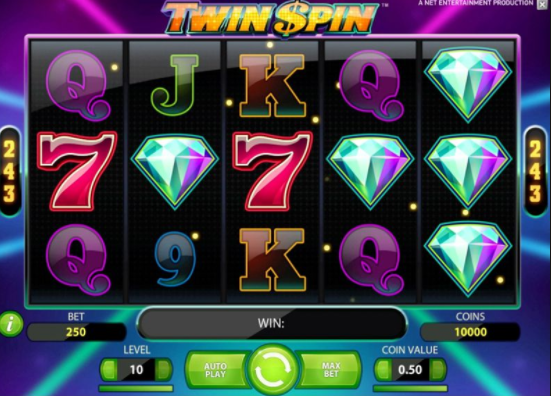 The 1000-coin jackpot, awarded when landing 5 Diamond symbols on a pay line, is certainly not out of the question at any point in the game – largely due to the cool Twin Spins feature. The best aspect of this game, alongside its many ways to win, is the way NetEnt have managed to put a new twist on a classic. With all the symbols coming from traditional, physical casino slots, the extra dimension of the Wilds and the twin Spins – along with the vibrant graphics and catchy audio – combine to create a new, contemporary environment for modern gaming enthusiasts to enjoy some classic spins. This is certainly a game to add to your favourites and can be enjoyed at any time of day, or for any style of betting.